Oh I’m so excited to show you this! My fun weekend led to one of my favourite acquisitions yet: the Lion Brand Bonbons! I’ve been coveting after the Lion Brand Bonbons since I read about them in the Lion Brand newsletter a while back. In the model’s hands were these iddy biddy skeins of yarn. I knew from that moment on I had to get my hands on these. What can I say? They’re tiny! How can you not “awww” just at the sight of them? Anyway, since seeing them in the newsletter, I hadn’t thought about them much. I don’t get to go yarn shopping very often, and when I do, it’s at Michael’s since it’s closest. On the other end of town is Hobby Lobby, but we don’t tend to go that way much. Saturday, my mom and I did drive that way, though. What did we find? Bonbons! 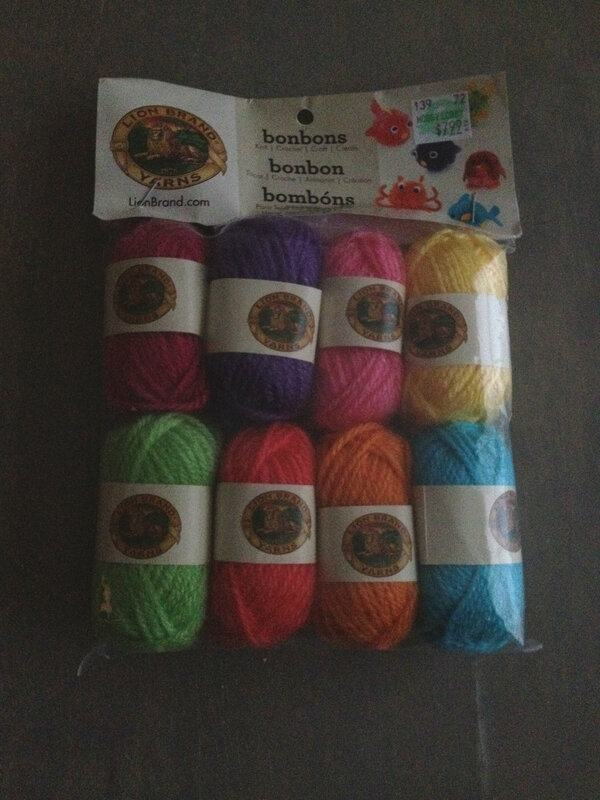 I bought the 100% acrylic bonbons in the Brights colorway, and they are light weight, so under worsted. The colorway description fits them perfectly. They’re little skeins of bright colour and so fun to look at. I haven’t decided what to make with them yet, but as I paid $7.99 (before tax) and I’m cheap, I’m probably going to do a lot of looking before I settle on anything. I didn’t get much knitting done at all this weekend, but I really wanted to show you my newest acquisition. What did you work on this weekend?